At Bob's Feed and Fertilize we have the fence, fence accessories or gate your looking for. Give us a call with any questions. Cattleman® 14g Barbed Wire gives you all the benefits you'd expect from a Bekaert fencing product: easier installation and sustainability while also saving you time and money through increased post spacing, less maintenance and a long lasting fence. 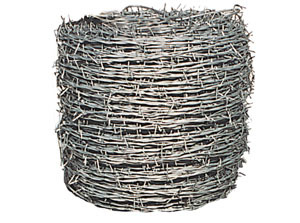 Our Cattleman® 14g Barbed Wire is perfect for the most demanding fence jobs. This product is Class 3 galvanized which will last 3 times longer and is 30% stronger than Class 1 12.5g low carbon fencing and 15.5g high tensile wire. Sustainable and light weight ,Gaucho® 15.5g Barbed Wire is directly comparable to 12.5g low carbon products, but requires less maintenance and is more cost effective. 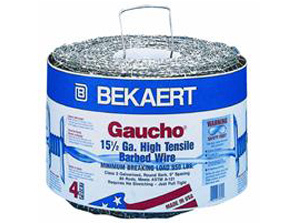 Our Gaucho® Barbed Wire is made of high tensile steel wire. This means we can use a smaller diameter wire while maintaining the same strength as conventional barbed wire. (Find out more about High Tensile ). This product is also is made with Class 3 galvanized coating which is proven to last three times longer than Class 1. 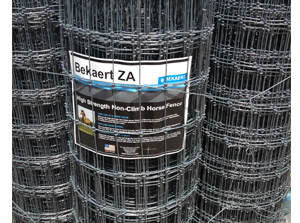 Bekaert field fences utilizes a woven wire with a hinge joint knot. Our field fences are offered in a wide variety of heights and styles that feature graduated spacing that starts with narrow openings at the bottom which prevents the entry of small animals. 39" x 330' , 47" x 330', 49" x 330'. 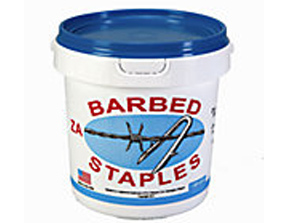 Premium barbed staples are manufactured from 8g ZA coated wire. These staples feature single or double barbs to hold securely in the post and have sharp right hand cut tips for easy driving. Choose shorter length staples for hardwood posts or longer lengths for softwood species. Available in 50lb. and 8lb. buckets.